Start a search or browse by topic below. To speak to customer support call 1 (800) 421-9668. In addition to the detailed property descriptions, IDX Broker provides a photo gallery for each listing. You can make some easy changes to the layout and display of this gallery to better accommodate your visitors. One way to clean up your photo gallery and make a drastic change is to enable your Enhanced Photo Gallery. This changes your photo gallery from a grid of photos to a slideshow of all the photos for this property. To affect this change, login to your IDX Broker account and navigate to Design -> Website -> Page Templates and locate the row labeled Photo Gallery and click Edit in the Preferences column. 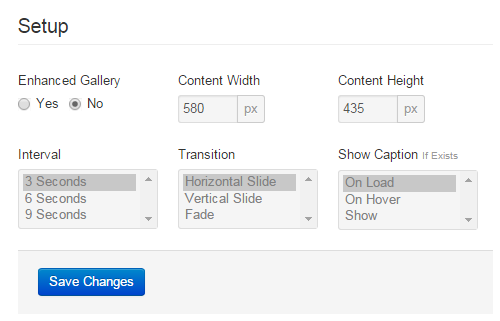 From this page you can turn on the enhanced gallery and edit the settings. To further change the look of your photo gallery with either the enhanced or standard gallery, you can change the template. Navigate to Design -> Website -> Page Templates in IDX Broker. In the Photo Gallery row, select Edit Page Layout. This will open our standard template selector and you can pick which template you would like to use to draw the Photo Gallery pages. Just click Activate for the template you would like to use. You can go back and forth if you don't like the selected template, so feel free to try a new one out. LOVING the upgraded product! I am seeing rankings, traffic and incoming calls increase already. Thank You! Our team is here to help. Call (800) 421-9668 or email support.